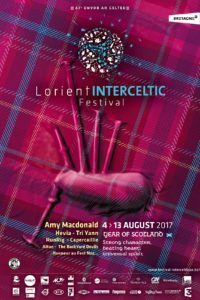 Recognised as one of Europe’s largest festivals, the Lorient Inter-Celtic Festival will be celebrating the Year of Scotland this month, with the prospect of more than seven hundred and fifty thousand visitors attending an extensive programme of events. Some of those singers and musicians will be representing the Isle of Man, which has a number of both historical and cultural l inks with Scotland. Although the ten day festival programme will showcase a whole variety of Scottish themes, it won’t all be about kilts, bagpipes, whisky and haggis, but there will be an opportunity to enjoy a selection of traditional fare and discover more about Scottish culture through the medium of exhibitions, lectures and film. 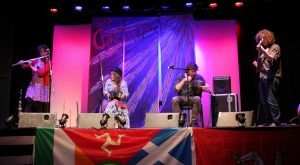 There’ll be a range of Manx performers flying the flag for the Isle of Man, including a number of up and coming singers and musicians who are continuing to garner global recognition for their talent and expertise. New band on the block, Birlinn Jiarg, was invited back to feature in the official programme after being spotted at the Manx Pavilion last year. Their music is set apart by the unusual combination of low whistle and clarinet, but has now gr own to include guitar, bouzouki, bodhrán and concertina. Also representing the Isle of Man will be newly formed Manx duo Annym made up of talented local performers Isla Callister and Cairistìona Dougherty, who have recently relocated to Glasgow to further their studies. They will be joined by Scottish harpist Rachel Hair and a small number of Manx dancers who will perform at various venues, with a Manx dance workshop at the Salle Carnot. Additionally, members of Rushen Silver Band will be returning to the festival after their highly successful Lorient debut in 2015. 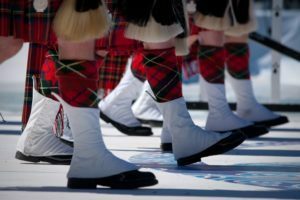 They will have a prominent position in the Grand Parade, but will also feature in the televised Nuit Interceltique evenings. Members of the band are also working in collaboration with a Scottish Pipe Band and a Welsh male voice choir, culminating in a joint presentation of Conquest of Paradise at the finale. There’ll also be the ever popular Manx Pavilion, organised again this year by Peter Young and supported by Culture Vannin and the Isle of Man Arts Council, with daily entertainment from a range of Manx artistes. Since its inception, the Lorient Inter-Celtic Festival has encouraged both art and sport, as well as the more traditionally perceived elements. 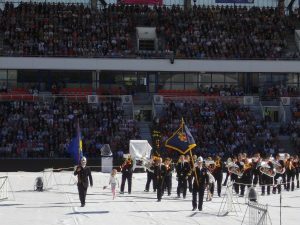 Selected highlights of the event include the Bagadoù National Championships, a series of Inter-Celtic Nights and the Grand Parade of the Celtic Nations, including some three thousand five hundred performers wending their way through the streets of Lorient. New for this year is the Inter-Celtic Seas Week (showcasing producers of the Celtic seas) and the Friendship Maritime Parade. ‹ All the Fun’s in Peel this Weekend………………………!